Description: This is a fashion accessories assortment that was sold to retail stores for resale. Each fashion accessory is designed to hold 1 or more Pocket Rockers cassettes. The assortment includes 3 different sets: 1) accessory set with a coiled bracelet and clip-on pin, 2) boys clip-on storage cases, and 3) girls clip-on storage cases. The clip-on storage cases have a molded belt clip on the back, and a button that spring open the case. 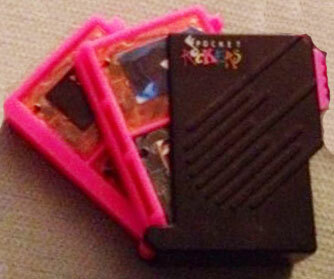 The case holds up to 4 Pocket Rocker mini-casettes. Designed for children ages 5 years and older. FPT22453 - Purple clip-on pin that holds one Pocket Rockers mini-cassette. This pin has a black litho on the front with "Pocket Rockers" written in multi-colored lettering. FPT22454 - Pink bracelet with a pink coiled wrist strap. The bracelet has a pink clip that holds one Pocket Rockers mini-cassette. 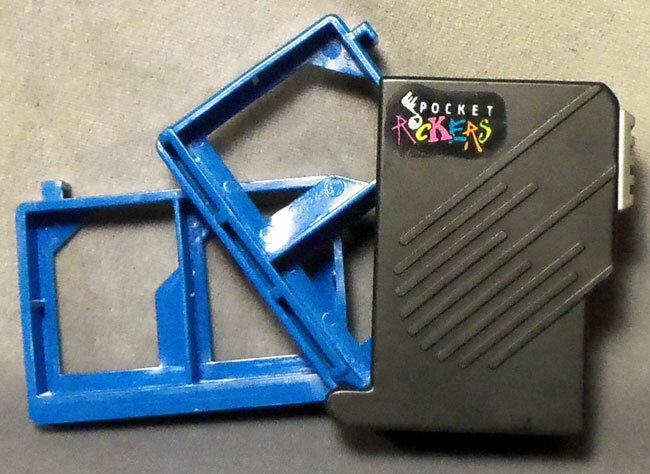 The clip has a black litho on the front with "Pocket Rockers" written in multi-colored lettering. FPT44922 - Black case with a molded belt clip on the back measures. The case has a pink button on one side that springs out 2 pink storage compartments when pushed. This case holds up to 4 Pocket Rockers cassettes. The case is marked "Pocket Rockers" in multi-colored lettering on the front upper left corner. FPT22263 - Black case with a molded belt clip on the back measures. The case has a blue button on one side that springs out 2 blue storage compartments when pushed. This case holds up to 4 Pocket Rockers cassettes. 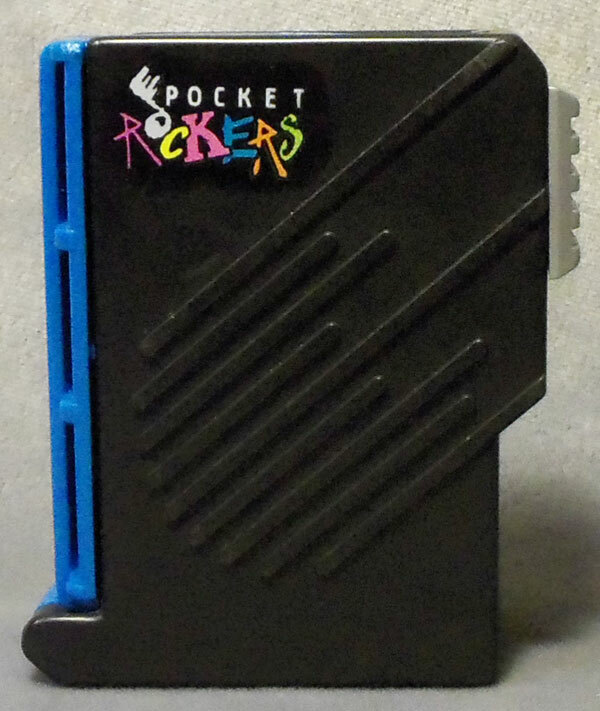 The case is marked "Pocket Rockers" in multi-colored lettering on the front upper left corner. Each set in this assortment was sold in a 6-1/2" long, 10-5/8" high, 15/16" deep blister card.